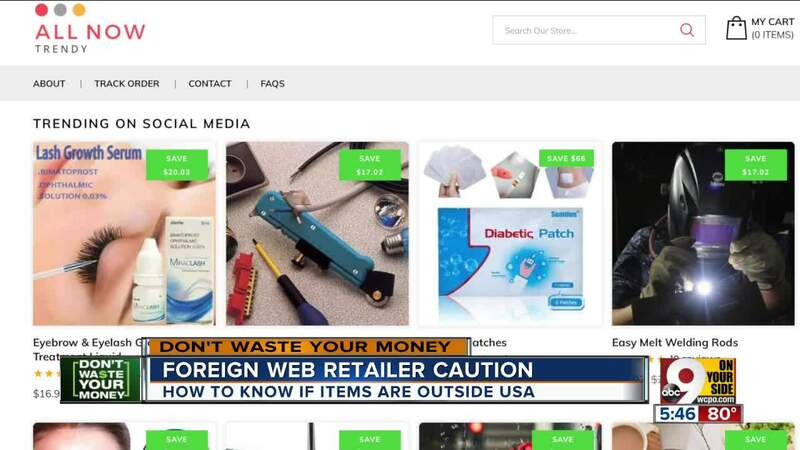 Many shoppers are noticing something different about online shopping in recent months. It seems more items are coming from China or other countries, and taking weeks to arrive. Gerry Broerman is a longtime online shopper. "I basically shop online all the time," she said. "I hardly go out to the stores." But lately, the Newtown, Ohio woman said, many things take weeks to arrive, and sometimes don't arrive at all. "I'll get an email that tells me that its shipped, and that it will take four to six weeks to get here because it was coming from China. And I didn't know I was ordering from China, I thought I was ordering from somewhere in the U.S."
This month, she said, she is waiting and waiting for "these diabetic patches, that's what I ordered." The site, All Now Trendy, was offering $77 test strips for just $11, a huge bargain. Where is the retailer located? The site lists a New York City address, in midtown Manhattan, so she thought she was dealing with a U.S.-based retailer. But we did some digging, and found the address for the website, 641 Lexington Avenue, 15th floor, NY, NY is a "virtual office," that anyone can use as their address for $89 a month, with a $150 setup fee. A Whois search revealed that All Now Trendy.com is actually registered in Canada, not the U.S. In addition, it has been in business for only two months, so it has no Better Business Bureau report. Broerman said she trusts Amazon more, but said many of their sellers are foreign-based too. "Ordering from Amazon now, sometimes I notice stuff is shipping from China," she said. Just because a product is shipping from China, that doesn't mean you'll have problems. Most of the electronics we buy, even iPhones are shipped from China. And the Chinese produce many top quality products (including iPhones, MacBooks, and most HDTVs sold in stores). But it usually means a much longer wait (two to six weeks, if not longer), plus you can have extra expenses if you need to return something. Amazon does not offer an easy option to filter out foreign-based sellers. Business Insider, meantime, recently reported on the pros and cons of the popular discount retailer Wish.com, which ships U.S.-based customers cheap products direct from China. It says the site's bargains are hit or miss. It says if you would like to stick with US-based sellers, there are hints a seller is outside the country. Look at shipping time: Longer than a few days, with no option to get it in 48 hours? It's probably coming from another country. Check the seller with the Better Business Bureau . Google the seller's name with the word "Whois" to see where the website is registered. We emailed All Now Trendy to try to check on Broerman's order, but have not received a response. And we could not find a phone number for them. If the site offers no city address, Broerman has learned "you can't find where its shipping from. You don't even have any contact information on them." In that case, you may want to look for another seller, so you don't waste your money.